Huddersfield moved up to second in Super League after Sunday's seven-try victory over Castleford at The Shay. The hosts led 18-6 at the break thanks to two tries from Leroy Cudjoe and one from Eorl Crabtree, Danny Brough adding the extras. Castleford replied through Richard Owen before second-half tries from David Hodgson, Lee Gilmour, Jermaine McGillvary and David Fa'alogo won it. Danny Orr and Owen crossed for the visitors but it made no difference. 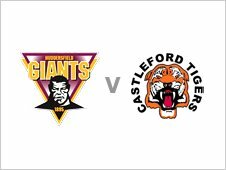 Kirk Dixon kicked three goals for Castleford while Brough and Cudjoe (2) kicked the rest of Huddersfield's points. The match marked the first of Huddersfield's three-match switch to The Shay, the Giants' temporary home while their Galpharm Stadium pitch is re-laid. Originally due for a 1745 BST start, it was delayed by 25 minutes due to broadcaster technical problems and a kit mix-up. It was eventually sorted when the Tigers were given Halifax's kit to play in, preventing a clash which would have seen both teams playing in white - and the game finally got under way at 1810 BST. Huddersfield's victory moves them back level with leaders Warrington at the top of the Super League table on 24 points. But the game was marred by two injuries - one for either side. Castleford prop Jonathan Walker looks likely to miss the rest of the season after dislocating his knee in an innocuous-looking challenge by Eorl Crabtree. And Huddersfield scrum-half Danny Brough, one of their key playmakers, faces six weeks out with an ankle injury. "The Shay is a nice little ground. It's going to be our home for the next few weeks and we're aiming to make the best of it. "We're not playing as prettily or as fluently as Warrington, but we're in the quarter-finals of the Challenge Cup and second in Super League and that gives us a good platform to work from." "It didn't help that we had the wrong jerseys on. I don't know whose fault it was. Whatever happened, the game was delayed and Huddersfield handled it better. "Some key decisions went against us. Jordan Thompson was given as out when he was actually in when the score was 6-6 and that was a crucial play for us. I also think we were a bit too soft. You can't afford to be like that against a side like Huddersfield. "It doesn't look too good for Jonny Walker. It was only his second game back after 13 weeks out and now it looks like his season's over. I was starting to get pretty excited about having some numbers back so this injury is another blow." Huddersfield: Grix; McGillvary, Wardle, Lawrence, Hodgson; Cudjoe, Brough; Crabtree, Robinson, Griffin, Gilmour, Horne, Fa'alogo. Replacements: Mason, Patrick, Kirmond, Faiumu. Castleford: Mathers; Dixon, Thompson, Arundel, Owen; Chase, Orr; Jackson, Milner, Emmitt, Jones, Ferres, Aspinwall. Replacements: Walker, Clark, Fozzard, Widders.